City officials in Oslo, faced with budget cuts, considered dropping their annual gift of large city Christmas trees to London, Reykjavik and Rotterdam, to save money. They apparently didn’t want to be seen as Scrooge, though, and the trees will be sent as usual. Newspaper Aften reported last week how the city earlier stopped sending trees, cut in local forests, to Antwerp and Washington. This year, Rotterdam was in danger of losing its tree because it reportedly was of little value in raising Oslo’s profile. Oslo bureaucrats were actually asked, according to Aften, to determine the costs and/or savings of carrying on with tree-cutting, shipping and tree-lighting ceremonies for all three cities as usual, dropping the tree for Rotterdam entirely and the tree-cutting ceremonies for Reykjavik, or ending the program in all three cities. Last year, it cost Oslo taxpayers NOK 780,000. 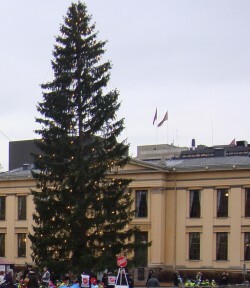 City politicians opted to carry on as usual, noting that the Christmas trees are a symbol of close ties between Oslo and the three cities. The head of Oslo’s city government, Stian Berger Røsland from the Conservatives, will also travel to London to attend tree-lighting ceremonies at Trafalgar Square. Either the vice mayor or city committee leaders will travel to Rotterdam and Reykjavik, and their spouses are invited along as well.